Super stable and tracks well. 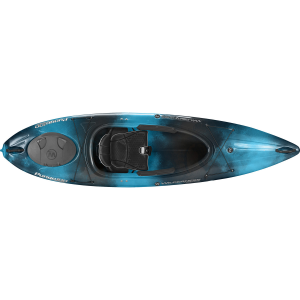 This is a great kayak for touring around lakes and rivers. Great for beginner paddlers and beyond. 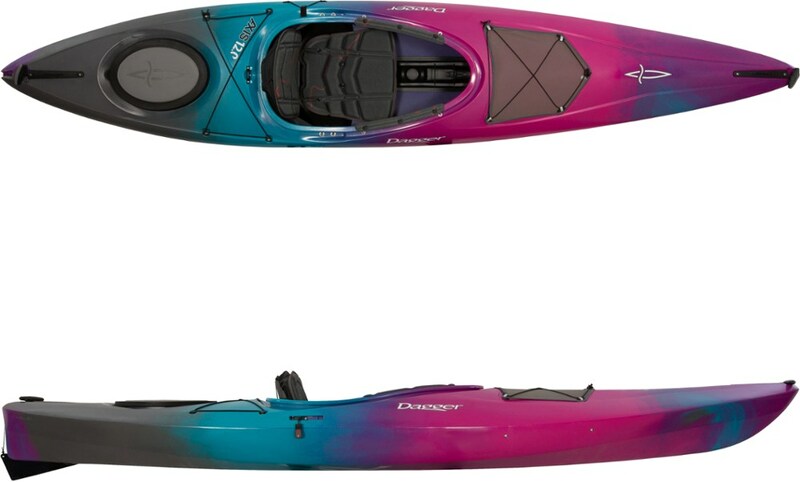 I've been a canoer my entire life but decided that my big 15' canoe was a bit too heavy for me to man-handle alone so I sold it and bought the 12' Wilderness Systems Pungo 120 kayak which weighs about 49 pounds (30 pounds less than my old canoe). I had never sat in a kayak before and I was a little nervous about how different it might be from my canoeing experience. My concerns were misplaced though because this kayak is very user friendly. Getting in and out of it is a breeze. The cockpit opening is HUGE and the boat is so stable I had no trouble standing up in the kayak on the water while holding onto nothing to help me get in/out. I was quite impressed with the stability. The seat, the Airpro 3, is pretty comfortable. I don't really understand how to adjust how far forward/back the seatback leans. I pull on the straps and it always just re-reclines all the way as soon as I put pressure on it. I'm not sure if I'm just missing something or if something wasn't set up right at the factory/store during installation. 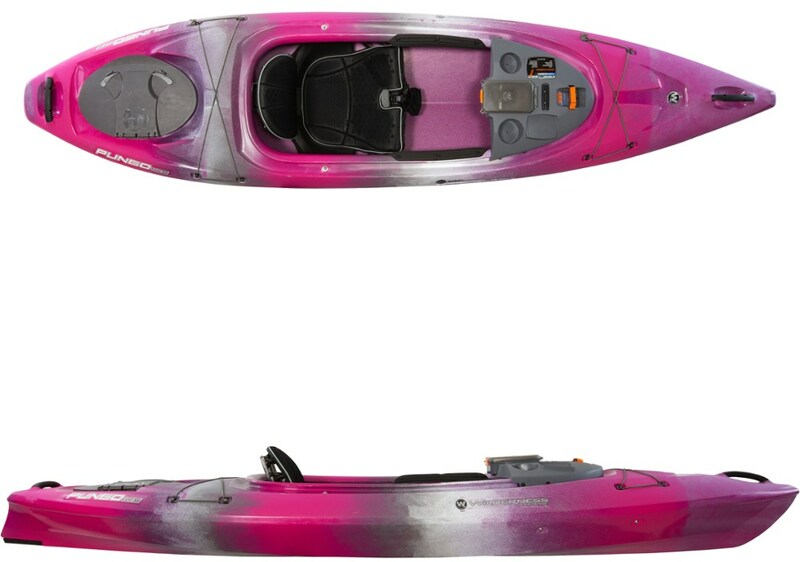 The seat and kayak come with zero instructions so hopefully, if you have problems, you can find a video online that will help you. So far I've not had any luck. Fortunately, I've still been pretty comfortable in the two floats I've done. 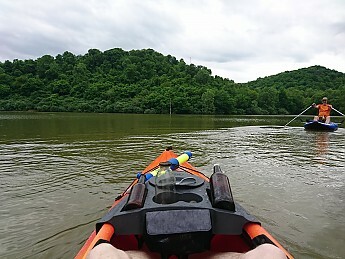 One was for about two hours on a very calm lake and the other was for four hours in a river that included a variety of conditions. The kayak caddy dashboard thing is pretty handy. The waterproof storage on it is small but it is indeed water tight. The little mesh bag on the front of it is a great place to store a waterproof camera for quick access. The cup holder, while shallow, holds a standard cup snugly. In fact, I ported my kayak with the cup in the cup holder, around a couple trees, and the cup didn't budge. The caddy was also a decent place to carry some trash I picked up on my lake float. Now I know to take a garbage bag with me. There is a perfect space for a trash container (or small cooler) right behind the seat. My one beef with the caddy is that the bottom edge on the front of it is kind of a rough/sharp plastic. I've nicked my shin on it one time. I am 6' tall, 34" inseam. My legs are pretty long and at times, when I've adopted a more aggressive posture, my shins have hit that front edge. I wish it had a little of the foam padding like that which installed as side knee padding. In this photo you can see my shins a couple inches under the caddy...and some of the trash I collected. The other guy is on a Sea Eagle with a row-boat attachment which was pretty cool. Speaking of the knee padding. I love that stuff. It isn't too squishy; it doesn't seem to chafe or rub my legs in a weird way at all. It's just there and my knees are comfortable the entire time. On the flip side, and this is probably just me getting used to paddling a kayak, I do hit my fingers on the flipside of the coaming sometimes and that gets pretty uncomfortable. Transport is easy. It only weighs 49 pounds so it is easy to get on and off my car; a small 2017 Honda Civic Coupe. 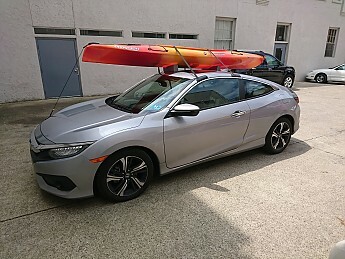 I hadn't thought I'd be able to carry a 12' kayak on my car but it sits in the foam blocks well (the hull has a decent V shape) and doesn't budge on the road (at speeds up to 55 mph so far). That V shaped hull really helps this boat track. It tracks really well. I was out with two friends on my river float—one was in a Maverick 100 (seen in the next photo) and the other was in a Perception and both remarked at how much better my boat tracked. I could stop paddling and just drift along without really worrying about turning into the bank (or around). With that said, really fast turns are not easy in this craft. If you alternate between a back paddle on one side and a standard on the other you can rotate pretty well, but this boat is not nimble. I've only had it for the one weekend but I'm very happy with the purchase. I had debated on getting a cheaper $300-400 starter boat but knew that in a couple years I'd want to upgrade so I just skipped it and went straight for the upgrade. I'm glad I did. This boat is easy to paddle and easy to get in an out of. It can support a spray skirt, has a very comfortable seat, and plenty of storage. The one thing I wish it had was a top drain plug somewhere—at the end of the day, when I cleaned it out, the only want to get the water out was via the top opening; but the inner coping is a bit of a lip so it is hard to get ALL the water out. Maybe there is a drain plug hidden in one of the logos but I have just not found it? If I do I'll update my review. Looks like fun, Bill! Thanks for sharing your initial experience with your kayak. I hope you'll keep us posted. thanks Alicia - sorry for the slow response. I'll check out that manual! I have used my Pungo 120 for 5 years and I am very pleased with it. The Pungo is very stable, tracks well and is easy to get in and out of due to the spacious cockpit. The seat is very comfortable and adjustable, you can recline in it like a lazyboy and put your legs up. The large cockpit also allows me to take my dog along for a ride. There is a sealed compartment in the stern for stowing your gear with a water tight hatch. There is room in the bow for a flotation bag or equipment stored in waterproof bag. The footbraces are easy to adjust thanks to an innovative system. When I bought my Pungo it only had one bungy on the front deck (like in the picture) so I added more which now is standard on the new models. I tried a lot of other kayaks before deciding on the Pungo and it was a good choice. I have taken it on a variety of bodies of water in a variety of conditions and the boat has performed superbly. For what it was designed for the Pungo is first rate and I would highly recommend it. I want to add to my review as I have had the Pungo in some scary spots over the last two seasons and it handled the waves superbly. I live at Lake Tahoe which is a big body of water with tempermental winds that can come up in minutes. Normally the best time is early mornings or evenings unless there are afternoon thundershowers then you want to be off the water. Last summer (2011) I went for an evening paddle with some friends for what was going to be a 3 hour tour (where have I heard that before?). There were some clouds forming on the other side of the lake, 12 miles away, but we didn't think they would come over to our side. Well we were wrong! We had just made it to our destination and where turning for home when the wind started to blow directly at us and quickly there were white caps on the lake. We ducked into a sheltered bay and waited to see how long it would last. After about 20 minutes the wind lessened but there were still 1-2 foot swells. As it was getting dark we decided to make a dash for our put in spot about 45 minutes away. Well the Pungos performed magnificantly, riding the swells with ease. We were supremely confidant in our boats and made it back without mishap other than a little bit of water in the cockpit. The second incident occured this past Sunday and again we were on Lake Tahoe. When we put in at 9:30 am the lake was like glass, very little boat traffic so it was a glorious paddle. Our destination was the Upper Truckee River Marsh about an hour away. By the time we neared our destination the power boat and Jet Ski traffic had increased creating some chop, but nothing severe. We arrived at the marsh and paddled up the river a little ways enjoying the wildlife along the way. By the time we returned to the mouth the wind had picked up and again there were white caps on the lake. The wind was blowing out of the Northeast and hitting our boats on the starboard stern. This made the boat want to go to starboard which is not were we wanted to go. So it required some hard paddling to keep the bow pointed in the right direction. A rudder or a skeg would have helped but other wise the Pungos again were super stable and we had confidence we would get back, tired but safe. We even had fun surfing some of the waves. We made it back okay and I just have to say that I love this boat. It has never let me down and I cannot think of any reason to get a different kayak. 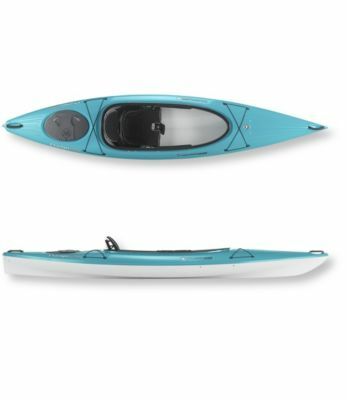 I highly recomend it to anyone looking for a awesome all around kayak. Until it got stolen this past summer my Pungo 120 was my boat of choice for over 8 years. It was the perfect mix between touring kayak, and recreational boat. 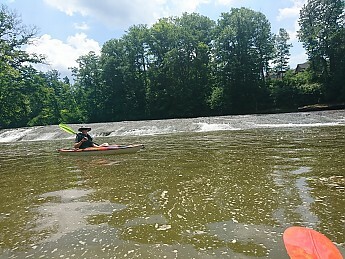 I would pack it up with 5 days worth of gear and some luxuries and hit the water and she performed brilliantly from flat water lakes in wind to small twisty rivers with some class 2 and below rapids. The seating system is fantastic, the hull design tracks dead straight, and is surprisingly fast out on the water. Paddling this boat was not a chore as most recreational boats are. You could easily store a weeks worth of gear in it. I hope my boat turns up again in the near future. I loved this boat like no other. I have a 17' touring kayak, a 10' creek boat modified into a whitewater expedition boat, a couple of river runners, a 10' rec boat, and another 12' kayak. None of them compared this boat. I miss my Pungo! 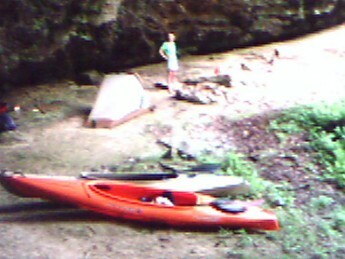 This was the first kayak I ever used, and it is a great beginner all around boat. 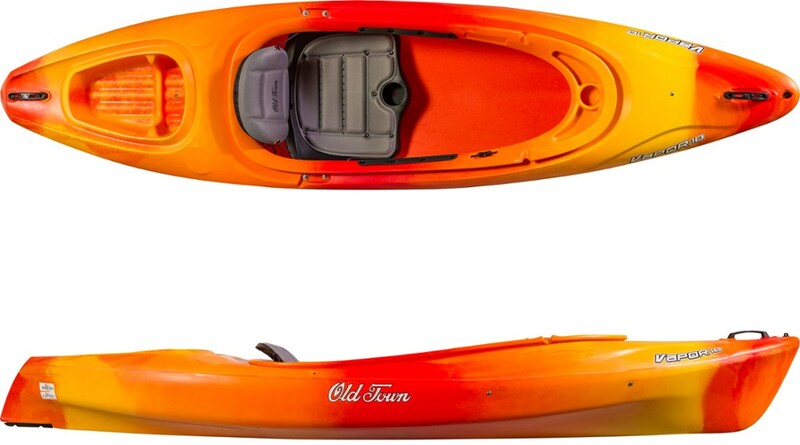 Handles a little bit of white water, goes great on the lake, hard to tip, and easy to get in and out of.